Ocean Soul Retreat in Seminyak focuses on women. IN THE '60s and '70s, enchanting stories of an Indonesian island started circulating among surfers. Rumour was that this island's shores were blessed with near-perfect water temperatures, soft breaking rollers and cheap accommodation. Swell-hungry travellers surrendered to the siren call - descending on Bali to catch waves. Soon salt-speckled surfers planning their next wave sprawled outside of warungs all over the south of the island. It's not too different today (albeit more crowded). Despite a rise in visitor numbers to Island of the Gods, the universal appeal of surfing in Bali has remained strong. And now there's more options than ever. "For the more experienced surfers, I believe (surf trips are) about community and meeting like-minded individuals," says Health and Fitness Travel co-founder Samantha Lippiatt. "For those who are entirely new to surfing, or for most beginners, it boils down to learning the skill in a time and place where learning is most conducive." If you want more to a Bali trip than sitting next to the pool, but don't know where to start, one of these surf retreats is the way to go. Blissful views to go with your stretching at Como. 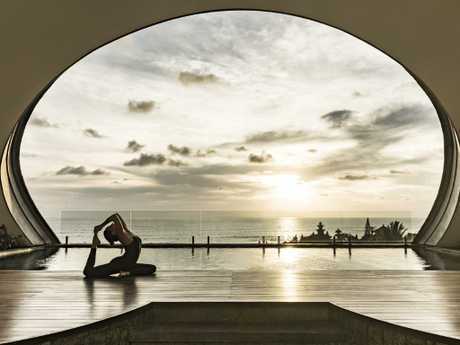 Combine wellness and watersports with in Bali's most up and coming town - Canggu. West of the more populated Seminyak, Canggu is fast becoming known for its laid back, hipster vibe, luxurious food offerings, and, of course, surf. The beachside resort, COMO Uma Canggu, offers a package deal where daily surf lessons from the luxury surf group, Tropicsurf (tailored to beginners or advanced). Accommodation is included in the price and starts from a kingsize room, which comes with a television, yoga mats, walk in rain shower and a rain shower. Price also includes breakfast, a 90-minute massage and a daily group activity, such as yoga and pilates. COMO Uma Canggu is an hour's drive from the international airport. Getting down to basics at Komune. When the rainy season hits, take advantage of the wind change and head to Komune on the east coast. Here, the waves roll in during the cooler months, while the west becomes less surf friendly. Located beachfront on the volcanic black-sands of Keramas, Komune offers guests a chance to take part in a range of surf and fitness activities. Ever fancied surfing at night? Then don't miss the chance to go floodlit night surfing. There's also boxing, spin and yoga classes, sunrise beach runs and a private fitness training session if you want to take the all-round #fitnessgoals approach. Onsite there are two pools, a day spa, outdoor cinema, fitness centre and babysitting services. Komune is 50 minutes from the airport and 25 minutes from nearby Ubud and Sanur. Price includes return private transfers. Meditative yoga is part of the Ocean Soul approach. Step back, boys - this surf retreat is one is for the ladies. Ocean Soul Retreat in Seminyak prides itself on helping you reach inner peace through the union of relaxation, surfing and yoga. Participants are given equipment and surf lessons at a Balinese-owned surfing school (with one surf instructor to two students) for five days. Aside from surfing, the program also includes daily meditative yoga sessions, two massages, wellness workshops and a personal coaching session. They even hold apnoea workshops, to both help guests relax in big surf and hold their breath underwater. Foodwise there is a nutrition talk with cooking demonstration, and all food - designed by a naturopath and nutritionist - is included. Ocean Soul is 30 minutes from the airport and transfers are included.